Experiences with the 1986 and 1997 levee breaks in Yuba and Sutter Counties and other “high–water” events over the past thirty years afford us some expectations for the types and extents of tree damage that may result from orchard flooding in 2017. Part one of this article will first discuss some generalities of flooding damage and two key types of damage that tend to follow prolonged orchard flooding, i.e., waterlogging and Phytophthora diseases. Parts 2 and 3 will reflect on the floods in 1986 and 1997 and considers ways in which specific conditions associated with those floods seemed to affect orchard outcomes. Finally, we will offer management steps to consider in dealing with orchard flooding in 2017. Tree damage from flooded soil is usually minimal if the flood occurs when the trees are dormant and the water continues to flow rather than remains standing in the orchard area. However, where water stands for extended periods in an orchard, two potential problems are of concern: 1) waterlogging of the root system, and 2) diseases caused by Phytophthora. Waterlogging. Waterlogging can be viewed as an “oxygen starvation” effect of flooding. When an orchard soil is flooded or otherwise saturated with water, the air in its pore spaces is displaced, removing the supply of oxygen to the roots. 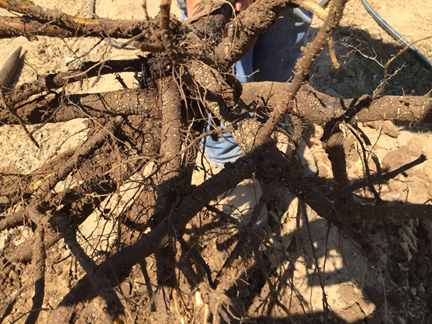 The terminal portions of new walnut roots can be killed within one to four days in a saturated soil. As saturation is prolonged, damage to roots becomes greater and can lead to chlorosis, leaf wilting, and in extreme cases, entire root systems can be killed. As soil temperatures increase, the negative effects of waterlogging are accelerated. Walnut trees apparently survive waterlogging events during winter due to a combination of low soil temperature and a lack of active roots. Waterlogging risk tends to be greater in “heavy” or compacted soils because of slower reentry of oxygen after saturation. Following floods in previous years, we observed less injury to trees growing in deep, permeable soils than to trees growing on soils with impaired vertical drainage caused by a claypan or hardpan. Waterlogging damage to walnut trees can vary in severity, may not be immediately manifest, and can be difficult to discriminate from Phytophthora damage. For example, decline of walnut trees is sometimes not obvious until late spring or summer, when backhoe excavations can be used to confirm suspected waterlogging damage on walnut root systems. Boundaries between dead, waterlogged portions of major roots and crowns and living parts of the same roots tend to be poorly defined and occur in the absence of distinct cankers and lab diagnostics that indicate Phytophthora crown and root rot. Waterlogged tissues often have swollen lenticels (Photo 1). Phytophthora diseases. Several species of the “water mold” Phytophthora are found in surface water sources such as our rivers and canals, as well as in infested soils. These fungal-like organisms can be carried along by the water and swim in it. After a levee break, the river water is a potential source of spreading Phytophthora inoculum throughout the flooded area. Flooding can bring active Phytophthora inoculum in contact with the aerial portions of trees, resulting in infections of the tree trunk, scaffolds and shoots. Flooding also increases the risk of root and crown infections by Phytophthora. Some Phytophthora species preferentially infect roots, but many preferentially infect the root, crown, or aerial tree parts. When Phytophthora infects woody tissues of trees above or belowground, it typically causes cankers (i.e., continuous, often-elliptical areas of dead bark, ranging from less than an inch to more than a foot across). The cankers often “bleed”. Removing the outer bark from the margin of a canker typically reveals a distinct, zonate (with concentric lines) margin, which is in contrast to the typically diffuse, non-zonate margin and vascular streaking evident at the edges of dead areas of waterlogged roots. In general, cool to moderate temperatures and water-saturated conditions in or on soil favor tree infection by Phytophthora species. Some Phytophthora species are more virulent than others, and risk of disease also depends on genetic resistance of the rootstock or scion. Within a given rootstock or scion, susceptibility to Phytophthora can vary with time of year. For example, in experiments on seasonal variation in susceptibility of walnut, almond, and peach rootstocks to Phytophthora citricola (which can cause root and crown rot and trunk and branch cankers), the rootstocks were least susceptible to infection during wintertime and most susceptible during the growing season. In contrast, infection by Phytophthora syringae in almond and peach is most likely during the cool conditions of fall, winter, and early spring. These cankers cease development when summer temperatures become lethal to this “cool-temperature” pathogen.